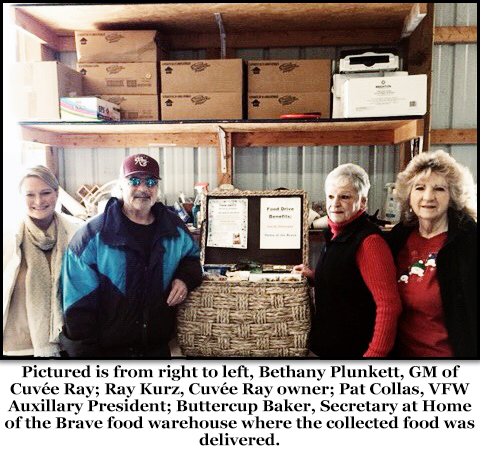 Cuvée Ray Kindness gives back to those who have sacrificed for us by teaming with VFW Post 7447 in a food drive for Home of the Brave veteran’s transitional facility located in Milford, DE. As 2018 was winding down, Cuvée Ray Kindness, (the charitable arm of Cuvée Ray Wine Bar & Restaurant) was collecting food at Cuvée Ray on Rehoboth Ave. When Ray dreamt of the next phase of his life, owning a wine centric business, giving back to the community through acts of kindness was a part of his vision. Ray and his wife and co-owner Debbie have a long history of helping veteran’s causes as Ray was a supporter of and former member of the Board of Trustees of a prominent veteran’s assistance organization, The Code of Support Foundation and Debbie volunteered for many years at the USO and before that volunteered at a homeless shelter. “Giving back to the community is a core foundational principal of Cuvée Ray and I am so pleased to help those who have sacrificed for us,” said Ray. For more information about Cuvée Ray and their charitable and other events, visit their website at www.cuveeray.com. Also, visit and like the Cuvée Ray Facebook page at www.facebook.com/CuveeRayRehoboth.